Tense, suspenseful, and edge of your seat entertainment the whole way through. Argo is a terrific movie. It is intense and dramatic and keeps you captivated throughout the entire film. The movie is about a group of hostages hiding out in a house in Iran and the crazy scheme that the C.I.A. comes up with to get them out. Everything moves fast in this movie, with no wasting time hanging back, introducing us to characters, and taking it easy. The film starts with a riveting scene of the attack of the American embassy in Iran. From there we meet Tony Mendez (Ben Affleck) and start watching his formulation of a plan. It’s a cool plan about making a fake movie to fool the Iranians. What really drives it home is that the CIA takes the plan seriously, going into production as if they are really making a movie, getting a script, doing casting sessions, and everything. 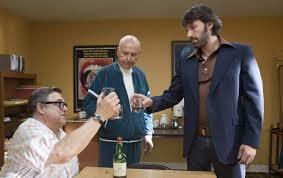 As a result of all this, Argo is not only absolutely thrilling, but it also has a good amount of comedy. The combination makes for a really great film! Argo is a smart, funny, and powerful movie. It keeps you focused and keeps your heart pounding throughout the duration, with boatloads of suspense. This is the way all movies should be made…thinking about the audience and what the experience of seeing the film is going to be like. The movie is all the better because it’s based on a true story. Knowing that helps us when circumstances occasionally feel too coincidental, or lucky, and we can rest assured knowing this is either all or mostly grounded in reality. The movie is about a hostage situation during the Iran crisis in the seventies. That description however, doesn’t do it justice. It makes this movie sound like Munich, or any other political thriller. Those movies tend to be conversation filled and often a little slow. Argo is exactly the opposite. It knows how to keep the audience riveted with tension and it finds all kinds of ways to do just that. This is one fast-moving flick! The movie begins with an introduction that tells us a little bit about what has happened in history. It fills us in on everything that happened with Iran, since Mosedeh came to power as the prime minister of the people and then the U.S. came in and replaced him. The movie doesn’t tell us everything, like how the U.S. was doing this all as a favor to England so that the Shah (the man who replaced Mosedeh) would be a puppet for England, but the movie tells us enough. It tells us about how terrible the Shah was and how when he was replaced by Ayatollah Khomeini, the U.S. offered the Shah safe refuge. And that’s what started Iran’s hatred for the U.S. The opening sequence of the movie is an attack by the people of Iran on the U.S. embassy. The people climb walls and bust doors and windows and the employees of the U.S. embassy try to escape in whatever ways they can find. The sequence is long and detailed, but it is also incredibly scary and exciting. There’s not a moment of it that is anything short of thrilling, and in those ways it reminds me a lot of the opening Omaha Beach sequence of Saving Private Ryan. Just like in that sequence, things happen here in stages and each stage is more exciting than the one that came before it. From here, we see the hostages (it’s strange calling them that, since they escape from those who are after them, but end up in the home of a Canadian diplomat, stuck in the country), waiting for a solution to present itself. There’s really nothing they can do, since the Iranian government runs the airports and would never let them leave. The Iranian people want to trade these hostages for the Shah. Only the us. Isn’t giving up the shah, and so the hostages are stuck in Iran. That’s when we move to us. Soil and follow the cit. on their brainstorming sessions of coming up with a plan to get these people out. We meet tony Mendez, (Ben Affleck), a guy who thinks whatever plans the cit. is proposing are all ridiculous. For example, one plan is to have the hostages pose as teachers; only no new teachers have not come into the country in months. Mendez knows all these details and he’s got a ridiculous proposal of his own. It is so ridiculous, in fact, that it just might work. His plan is to have the entire hostages pose as the members of a film crew. The way he’s going to do this is by following all of the proper channels as if a Canadian film crew was actually going to make a movie there. But it isn’t enough to have the hostages pretend they are people doing these jobs. For this to work, every bit of it has to be believable, and so Mendez hires two guys out in California who make real movies for a living to help him make his movie. The making a fake movie element is one of the strongest and also funniest points in the movie. First Mendez gets a makeup guy (john Goodman), then a producer (Alan Arkin), and then from there they go to work on the movie. They get a script and storyboards and then start having casting calls. People come dressed as all sorts of creatures for this alien space movie, and it’s all in the interest of making the film seem real. The more they actually do and know their parts, the more believable this all will be. When he gets to Iran, Mendez keeps up with the fake story, going to see all the right people to get permission to be there and scout out sights for his movie. On the day before their escape attempt at the airport, he even brings them all out to pretend to be looking at a site. They walk around the streets snapping photos and doing everything that their characters would most likely do. It’s all a lot of fun. Especially the idea that the Iranian government believed the movie story so much that they hired men to take Mendez and his team out to scout locations. Mendez never expected this to happen, and now since the government has called his bluff, he and the hostages are forced to go. I’ve been a fan of movies about making fake movies before. There aren’t a whole lot of them, and that’s because more often than not, they turn out kind of dull, like wag the dog. But Argo pulls it off perfectly. The comedy is top notch and the tension is very real. There are plenty of moments toward the end of the film that feel like coincidences or too many things going wrong, but then there are some that are kind of believable. Like when the bus won’t start for a moment. Any other time nobody would notice or care, but because these guys are in such a rush, every second counts and they notice every little thing. The movie might take liberties with it’s ending, but it’s all in the interest of making a more exciting film. And Argo is just that. It’s Ben Affleck’s third movie as a director, and he is clearly doing great for himself. Three for three. 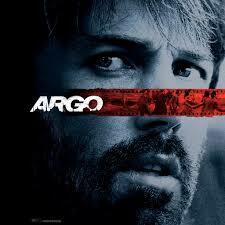 Argo might actually be the best of his films (although the others are both fantastic, so it’s a tough call). Either way, it is the best movie of 2012, and a hell of a ride.